Quality linen or cotton available in off white or natural. Custom colors upon request. Shirts are generously cut with serged seams and made with high quality fabrics. Our men's colonial shirts are of the highest quality fabrics and will be long lasting, able to withstand a lot of wear. Men's 18th century shirts were generously cut and practical for daily use. 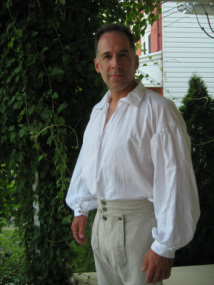 Colonial 1770's linen dress shirt is perfect for special occasions or for reenactors that are portraying officers or wealthy gentleman of the time. This shirt has finer linen and ruffle detailing.